Have you found your soulmate? What's on your lover's mind? Are you on the right path in your career? Call Marilyn Peters and uncover the truth! Marilyn, a Taurus has a background in the healthcare field and she is a single Mother of a wonderful 8 year old boy, as well as being a psychic. Marilyn is a Clairaudient , Clairsentient, Clairvoyant, Spirit, and Angel healer. She realized her psychic gift as a teenager, a gift she inherited from her grandmother, who was also a psychic. Marilyn has been practicing her psychic reading skills for 25 years. At an early age, Marilyn developed her skills interpreting visions and being an angel guide. She enrolled in an Doreen virtues Angel therapy school to further develop her skills. 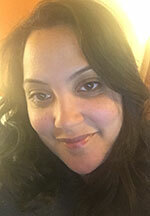 Angel is a Reiki Master, angel Healer and certified Angel therapy Practitioner. She has used these skills to let the angels guide her to people who need her help, and to help improve their lives. Angel Card and Tarot readings, rune castings, healings and she has her late hubby who is her spirit guide to help her along the way. Marilyn Peters is unavailable ... but you can arrange a call back!